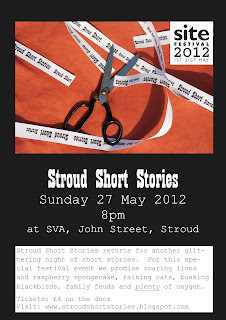 Stroud Short Stories returns on Sunday May 27th with a glittering line-up of short stories for a special Site Festival event. On offer will be roaring lions and raspberry sponge cake, raining cats, busking blackbirds, family feuds and plenty of oxygen. As usual, all stories have been selected from submissions, are read by their authors and are under ten minutes long. The headliner for the event is Tania Hershman (“a writer dripping with talent, this is as good as modern reading gets” New Scientist), author of two collections of short stories, The White Road and My Mother was an Upright Piano. The event will take place at Stroud Valleys Artspace, starting at 8pm. Entry is £4 on the door.